Savory Brunch Melty Muffin. Guy/Dad/Husband-Approved. I love breakfast sandwiches. Who doesn't?! 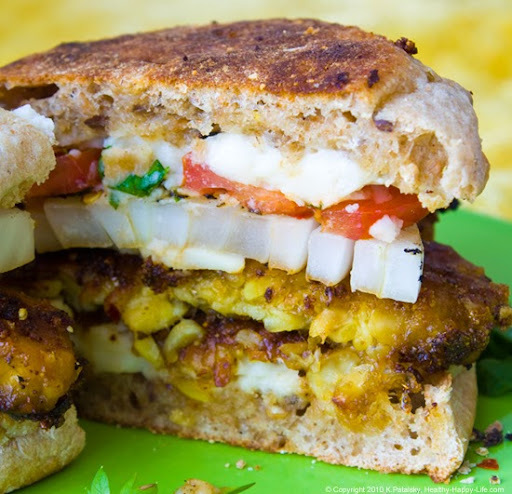 But healthy and vegan are usually not the words used to describe a traditional breakfast sandwich. Recipe makeover needed. Healthier Breakfast Sandwich. This hearty breakfast sandwich combines classic AM flavors like maple syrup with sophisticated accents from fresh herbs. 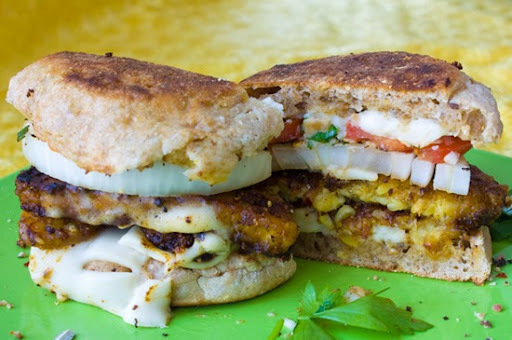 And yes, this towering cheesy-facon recipe is guy/husband-approved... according to my husband who inhaled this sandwich the first time he tried it - and has requested it several times since. 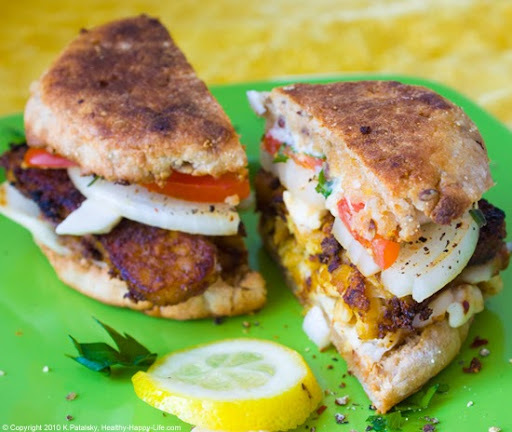 ...Feed your guy a healthier alternative to the breakfast sandwich he loves. He may be surprised by how delicious it tastes! Upgrade Your Breakfast. These ingredients are hands down healthier than the ingredients in a traditional muffin sandwich, like: traditional cheese, processed bacon and/or sausage, eggs, greasy oil, white flour muffin and etc etc. More Healthy Ideas: Five more ways to Upgrade your Breakfast here. *Tempeh Bacon Recipe and Ingredients here. optional: raspberry jam spread onto one side of the muffin. 1. Toast the whole wheat English Muffin. 2. Spread each side with vegan buttery spread. Set aside. 3. Make the tempeh bacon. Recipe here. With heat still on, top tempeh facon slices with cheese. 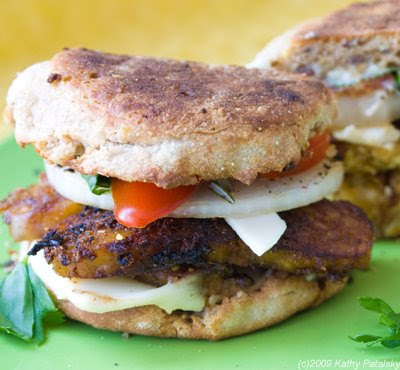 Remove tempeh bacon and cheese pile from pan, pile on one side of English Muffin-cheese side down to stick to bread. 4. Next, place onion slice in still hot greased pan to do a quick braise on each side. This should take 5 seconds on each side. You just want the flavors and heat to absorb into the outer sides of the onion. 5. Layer to onion on top of the tempeh bacon. 6. Next, sprinkle the chopped herbs and parsley in between the tempeh and the onion. The heat will gently release the fresh flavors. note: you can also add the fresh herbs to your pan when cooking the tempeh facon. 7. Place the tomatoes on top of the onion. Place the top half on the muffin - add optional raspberry jam spread here. Secure with 2 toothpicks. Cut in half. 8. Remove the toothpicks. Serve with a garnish of fresh lemon and parsley. Serve!